Ghalia and Farris, born and raised in Egypt, are cousins. Seventeen-year-old Farris has no problem expressing his love for thirteen-year-old Ghalia. Ghalia says it's wrong. She says that their parents won't approve, but Farris doesn't give up. 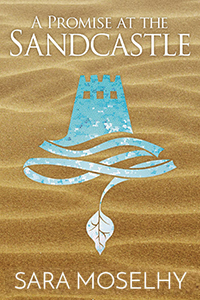 A Promise at the Sandcastle visits a social tradition that's banned in many countries yet accepted in others. Farris and Ghalia’s experiences invite readers to reconsider their definitions of "right" and "wrong" relationships. Farris stops the door with his foot. “What’re you doing here? You can’t be here,” I whisper and scan the hallway. I don’t want my neighbours to hear us. “What do you mean I can’t be here? I’m coming in.” He frowns and steps forward. - an excerpt from "Farris"